All Wendekreisen rental vehicles may be taken on the Interislander ferry service. However, we also welcome any other person browsing this site, to use our services. To book the Interislander crossing with Wendekreisen, simply click the 'Make a Booking' button. The system will quote the fare and ask you to enter a few details. Once you have submitted your ferry booking request, our team will book your ferry and send the Interislander ferry voucher to you by email. This voucher will validate once you have paid for the fare online. Our Team is available to you 7 days a week. Interislander tickets are non-refundable if you miss your sailing. However, your ticket is fully flexible and may be changed or cancelled without fee (NOTE: Changes and Cancellations must be initiated by email or telephone during Wendekreisen office hours and at least 2 hours prior to sailing). If you have paid your ticket in full and wish to cancel your sailing, we will reimburse the full fare to your credit card. Interislander travels between the North and South Islands of New Zealand and is one of the most spectacular cruises in the world. With 92 km of breathtaking views, the three-hour journey between Wellington and Picton really is one of New Zealand's most iconic tourism activities. 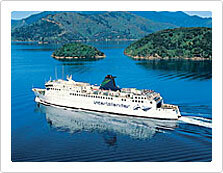 Interislander operates three ships, the Kaitaki, Arahura and Aratere, for you and your vehicle. We have up to 11 sailings a day, so you'll always have a wide choice of travel times. Once you’re on your Interislander cruise, you can take a stroll on the decks, enjoy a meal, a drink or even catch the latest movie releases. Or you could just choose to relax and take in the breathtaking view. Please note that the ferry timetable is subject to change regularly. Please check your ferry voucher and contact Interislander 48 hours prior to sailing, to ensure your departure time has not changed. Wendekreisen will not accept liability for any missed sailings due to changes in the timetable. Ferry Rates - "Easy Change Tickets"
Easy change tickets are flexible fares and allow you to change or cancel your sailing up to 2 hours prior to sailing without paying any fees. Wendekreisen highly recommends to pre-book your sailing during peak season. Prices are in $NZ and include GST. To book the Interislander crossing with Wendekreisen, simply click the 'Make a Booking' Button. The system will quote the fare and ask you to enter a few details. Once you have submitted your ferry booking request, our team will book your ferry and send the Interislander ferry voucher. This voucher will validate once you have paid for the fare online. Our Team is available to you 7 days a week.